Home > Hallmark MAGIC Ornaments > Hallmark Magic Ornaments (2009 - 2011) > 2011 Ho! Ho! Ho! Tasty Snow! 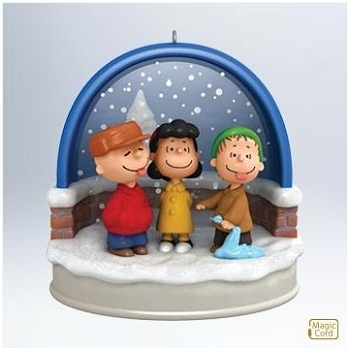 Bring a memorable moment from A Charlie Brown Christmas to the tree with dialogues and snowfall lighting effects. Connect to your Magic Cord (sold seperately) to see warm, constant light effect. Press the button to watch a synchronized sound and light show featuring all the ornaments connected to the Magic Cord. This 2011 Hallmark Ornament was originally offered as a Hallmark Gold Crown store exclusive. Size: 3½" x 3½" x 2½"